Life is like a divine dessert. Especially when you're wearing this sweet dress by LOVE Moschino™! Removable shoulder straps. Side zipper closure. Slender belt with a LOVE Moschino engraved buckle. 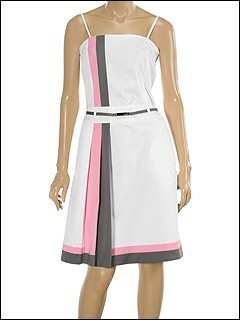 Stylish colored stripes accent the right front of the bodice, the pleats on the right side, and the bottom hem. 35 dress length. 98% cotton and 2% elastane. Dry clean only. Free shipping in the USA.